I hear from my Catholics that Ash Wednesday is next week. My local drugstores have been fully stocked with Easter candy way in advance of such events so I wasn't sure when it was actually going down. Of course this all means my off-the-wagon diet will be further pushed to a gluttonous edge by pre-Lenten feasts, beginning today. Oh yes, Peter Pan is bringing on the pączki. Holla! 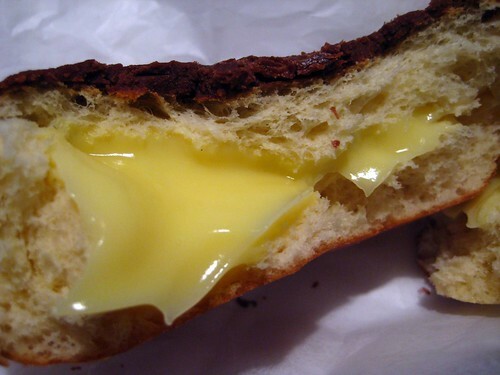 Recap on pączki: it's a Polish delicacy usually only available the week before Ash Wednesday. It's a BIG thing in the Midwestern Polish communities, and common enough amongst our local Poles. Peter Pan, which is not owned by Polish folk, raises the pączki bar, since most of what's around Greenpoint isn't made fresh. I was introduced to them last year, and totally fell in love. I also got a Polish ribbing from a co-worker who hasn't had good pączki since immigrating from Poland. I'm not sure if they'll have them in the morning; last year the pączki didn't come out until the early afternoon. I am willing to sacrifice my lunch hour to bring my wonderful co-worker some fresh pączki. If you want to figure out what to try, our friend James Boo tasted ALL the varieties last year. I'll see how they measure up to this year's batch. Rock the Vote for Pi(e)!